There are sooo many good craft sites - places you can visit for ideas, to learn new skills, and/or to share photos of your work. 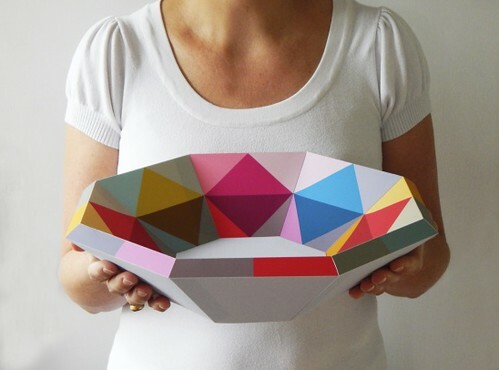 One of my favorites is Kollabora, where I was introduced to the colorful paper crafts of designer and illustrator Ellen Giggenbach of New Zealand. In fact, this picture is the very one that caught my attention. 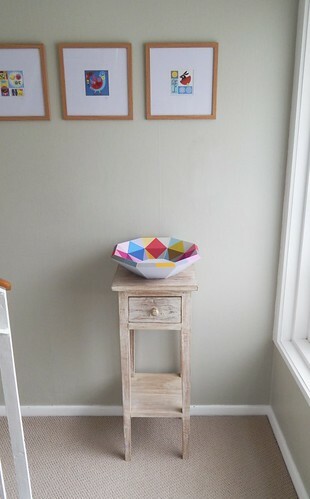 Ellen's Kaleidoscope Faceted Bowl is such a great display piece... not only is it eye-catching, but guess what - you can make one too because the design is available in both kit form or as a printable paper craft via her Etsy shop. Remember the post about paper craft kits? I would have included Ellen's shop if I'd known her then! Here are several more examples of her craftable designs. 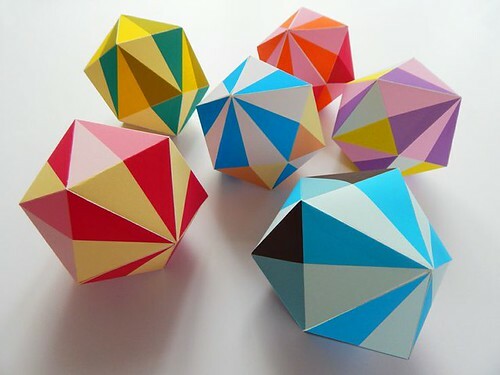 Bright Geo-balls aren't just for Christmas... I'd keep a batch on view year-round. 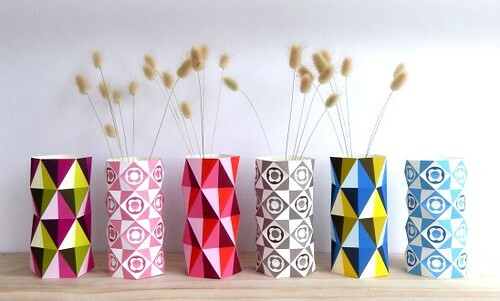 These stylish paper vases are adapted from the ball pattern. All you do is print on firm paper, crease, fold, and tape together. Place a jar inside and add some flowers. 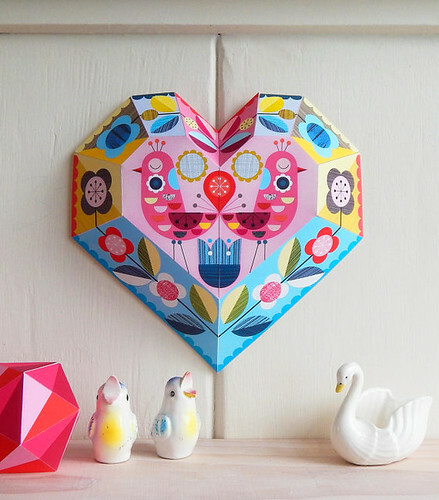 Ellen's paper hearts (they arrive laser printed on card, ready for you to fold and assemble), birds, and colorful art prints would be bright and cheerful decor in a child's room. Her paintings remind me of German folk art... which is actually not at all surprising because she was born in Bavaria. 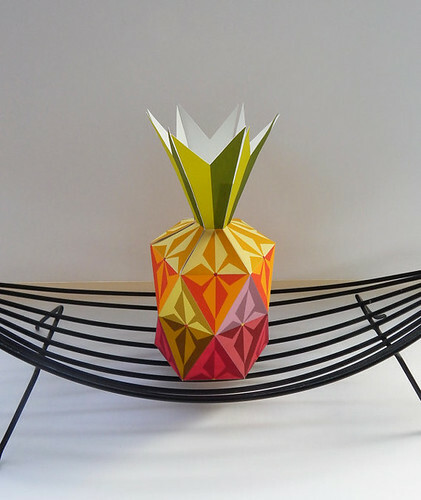 Her newest design is this folded paper pineapple - fun table decor for warm weather entertaining. Ellen blogs and is on Facebook. these are so much fun! - off to check out her shop! Her shop is delightful! Such wonderful colours and gorgeous designs. Love how colorful those are! Folded pineapple looks delightful. So many colourful beautiful things in her shop!